A local approach  the integration of public health with managed care  is what a lot of states and CMS are starting to look for, explains Pamme Taylor, vice president of advocacy and community-based programs for WellCare Health Plans. 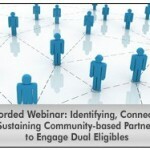 In HIN’s special report, Community Care Connections for Dual Eligibles: Closing Social Gaps to Improve Health Outcomes, Taylor describes some of WellCare’s efforts to connect its dually eligible population to health services, including making contact, identifying services for each member and assessing health status via health risk assessments (HRAs) that are part of these community services. Question: What is WellCare’s strategy and practice for contacting dual eligible members and ensuring follow-through with recommended referrals to community support services? Response: This question is two-fold; first, how do we reach the members and get them engaged? And second, how do we verify that services were rendered? For members, we have street teams that go out into the community investments. We also have community health workers on our interdisciplinary team. It’s their job to connect with our members on a face-to-face basis while also connecting them to community supports. It’s through that model that we heavily rely on engagement and connectivity, etc. Our first line of outreach is through the phone; our second line is through the community health workers and the individuals that are ‘feet on the street.’ And then, how do we verify that services were rendered, and how is that data collected? We have a command center, which is the warehouse of all that information, and then the social service electronic health record (EHR), which bolts onto the member’s medical record. That process produces a provider roster that we then put into the hands of our field teams, who use that as part of relationship management, much like a provider relations representative would use in their engagement with the primary care physician (PCP). We meet with them on a regular basis to confirm that services were rendered, and review the successes. The secondary piece to that is our case managers also reach out to the members that they have referred to services and activities. They verify through the members they received it and their level of satisfaction. So there’s two points of feedback: one from the provider themselves and one from the member. Question: How do you identify community services to meet members’ needs? We use about 67 different categories of social supports. We turn that into research. We go ‘feet on the street’ to canvas the neighborhoods to make sure that we have all of the organizations represented. Then that’s put into a ‘pend’ status in our databases and it is vetted on a secondary level of review by our team of liaisons. Once it’s vetted and confirmed, it’s then put into the final database, which is used for searching by our case managers. It’s a combination of public health practice using both public health and managed care terminology. There is no magic number of categories or organizations. No one’s ever systematically inventoried or catalogued the network of social services. That’s what we’re hoping to do  explain and quantify what organizations exist, then identify their service area, their reach, their service portfolio, and the volume of connectivity that the health plans have with these organizations for specific services. It’s an exciting time. Question: What other components of the comprehensive health assessment are administered to the duals as they come on board? Response: A number of different factors go into the HRA that’s completed. There are health factors, socioeconomic factors, living environment, and activities of daily living (ADL). What are their social needs, what are their social supports, etc.? There’s a whole number of different tiers of questions that we ask as part of the HRA. We use very specific tools that are either state-dictated or guidelines produced by the state or in partnership with CMS. It depends on which side of the equation that we’re being contracted for, and it depends on what’s already in existence. The major health issues that cause chronic health conditions — obesity, asthma, heart disease and diabetes and injuries — can be shaped by living and workforce conditions. To improve wellness, a growing number of cities and states are conducting health impact assessments. Pew’s Health Impact Project’s infographic on the subject looks at the growing number of assessments and the areas they are assessing. You may also be interested in this related resource: Derryberry’s Educating for Health: A Foundation for Contemporary Health Education Practice.